> NETIQ > Service Outages: Is Your Monitoring Strategy Working? If your organization is like most, you’re tired of being blind-sided by service outages, poor application performance, user complaints, or system failure. System and application management is a given, but is there a way to assemble information into a single management view and monitor applications, systems, and infrastructure according to the services they support? 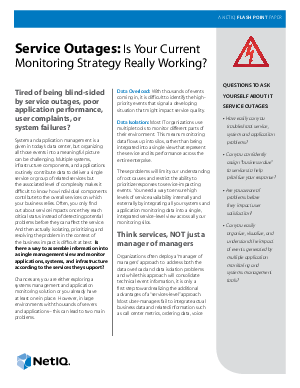 This free NetIQ flash point paper discusses system and application management and the struggle against service outages. With data overload and data isolation often being the root cause, a services-level approach can reduce the potential of impacting events. It covers questions you should ask yourself about IT service outages and the three steps of implementing a service-level solution.